The Righteous Brothers In Las Vegas 2016 written by: Hope Favor 2016 is just getting better, with the music industry experiencing new and revived tastes time and again. At the start of the year, the legendary blue-eyed soul and pop group, the Righteous Brothers, announced that they will be reviving their grove. Without a surprise, the group will be entertaining their fans in the Sin City, Las Vegas, for a long time this year. They might have been out of the entertainment scene for around 13 years, but they have proven to be naturally blessed to make the crowd go wild. 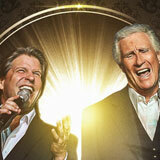 The Righteous Brothers Vegas show is already in progress, and it is set to conclude later on this year. Initially, the Righteous Brothers consisted of Bobby Hatfield and Bill Medley. The two are not blood brothers, but they shared the same year of birth, 1940. Hailing from Southern California, the two singers formed the group, and they were highly recognized in the 60s. Before majoring in pop and blue-eyed soul, the two delivered R&B and pop. Some of the well-known hits of the group include Unchained Melody, which was ranked the 4th pop and 6th R&B song on the chart, and You’re My. Bobby was the founder of the group, who then invited Bill to join him. The duo parted ways in 1968, leading Bill to pursue a solo music career. Bill recorded several recordings on different labels. On the other hand, Bobby linked up with Jimmy Walker, who was a member of The Knickerbockers. Bobby and Jimmy retained the name The Righteous Brothers and released a couple of songs. As the two did their thing, Bill went on to release his first track; I Can’t Make It Alone. Rumors had it that the song was intended to send a message to Bobby. Ironically, the song did not make it big on the market like the other songs they released with Bobby. Jimmy and Bobby went on to record an album called Re-Birth. Bobby seemed to be more successful since he was featured in a TV film, The Ballad of Andy Crocker. Bill’s solo career was not impressive at all, and for that, he decided to approach Bobby for a reunion. Later on in 1974, they made an announcement that they were working together once again. This announcement was made on a TV Show, The Sonny and Cher Comedy Hour. After that, they signed with a recording company, Haven Records, which was managed by Brian Potter and Dennis Lambert. In a few weeks of their reunion, the duo released a track, Rock, and Roll Heaven, which was originally done by Alan O’Day. This song was a tribute to all departed rock singers. It was on the Billboard Hot 100 at #3. The Righteous Brothers went on a top-list drought for many years, until when the founder, Bobby Hatfield passed on in 2003. On the 5th of November, 2003, Bobby was in his hotel room when he was found dead. Unfortunately, Bobby was expected to perform the same day with Bill. This news shocked the fans, and the group became a household name once again. The cause of death, according to the specialist, was the blockage of arteries. This then leads to a poor flow of blood, and Bobby couldn’t survive the situation. The loyal Bill went on with his solo career, but he commemorated Bobby in his concerts with a screen projection of a footage of Bobby. Bill Medley made the official announcement that he is reviving the group, and a vibrant replacement of the late Bobby is joining. Bucky joined Bill as he takes part in the Righteous Brothers Vegas show with the long-term member. He is known to be the most adaptable vocalist in America. Bucky helps Bill to bring back the group, but with a new touch. He is also known as an amazing rock and roll singer that has an excellent vocal range. With the blend of the signature baritone voice of Bill, the two are unstoppable. Bill is an incredible songwriter that delivers unmatched lyrics. With the introduction of the already talented Bucky Heard, this show is one to watch out. The orchestrated duet of the two comes in a perfect tonal variation. Bill throws in his baritone voice that is easy and strong enough. Bucky breaks in with his excellent falsetto range. The two voices make a duet that you will want to listen for 75 minutes, which is the length of each show. Going down at the popular Las Vegas spot, Harrah’s Showroom, this is a show that you wouldn’t want to miss. After the death of Bobby, Bill has gone solo for close to 13 years. However, it is said that the new member of the group, Bucky Heard, is already working with Bill to release a new CD. Bill claims that the fans of the group, producers, and some special friends have pushed them to do the recording. Even though he admitted that it was such a challenge to carry on without Bobby, Bill promises to give the fans the best of their performance. Earlier on, Bill encountered the elegant performance of Bucky, who had performed in a Journey tribute concert. From there on, he picked him to help carry on the legacy of The Righteous Brothers and give the fans the best. The orchestration of their voices proves that they can carry on the mantle even further.